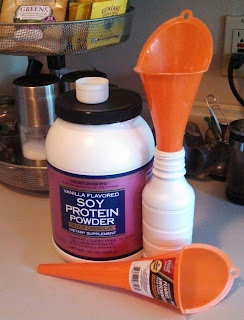 I was looking to get away from the WalMart protein powder I decided to give Trader Joe's Vanilla Flavored Soy Protein Powder a try. COST: It a little over $10 for the tub and that was just about 1/2 of the price of Whey Isolate from WalMart. You also get more so that is a plus. CARBS: DaliyBurn reports that the carbs in Trader Joe's Vanilla Flavored Soy Protein Powder is 1g per serving. Total calories are 120. TASTE: Defiantly has a different taste then the Whey Isolate. It's more of a grainy flavor. I had to add some Splenda to the mix. Arguably this adds cost. OTHER ISSUES: Several conflicting studies have been published suggesting that using a soy protein in your diet can cause 'feminization' of men. The studies are mixed so I really don't know how I to intemperate this but Just in case I decided to protect myself by using modified OIL funnels and re-used "Muscle Milk" bottles to give my Protein station a more "manly" look. (LOL). VERDICT: I found it to be it's less expensive and somewhat filling. When mixed it's thinner then Whey Protein. If you are trying to build muscle then I would recommend staying with Whey Protein. Once this jug is done I will be going back to it. UPDATE: Check out part 2 of this blog "DIY Coffee Concentrate for your Low-Carb Protein Powder Drink"
I am a father, husband, self proclaimed philosopher and mental/physical health enthusiast.